The oldest inscription in Türkic alphabet, the Issyk Inscription, written on a flat silver drinking cup, was found in 1970 in a royal tomb located within Balykchy ( Issyk), a town in Kyrgyzstan near Lake Issyk, and was dated by 5-th c. BC. In the tomb was a body of a man dressed from head to toe in magnificent attire, the clothes, jacket, pants, socks, and boots all had a total of 4,800 attached pieces of pure gold, greatest ever found in a tomb except Pharaoh Tutankhamen. The top of cone-shaped crown covering ears and neck carried golden arrows emblem. A sword on the belt right side and a knife on the left were in sheaths. Beautiful relief ornaments of animal art decorated shields, belt and front of the hat. Radiocarbon tests determined the age of the finds as belonging to the fifth century B.C. What was the world in the 5-th century BC? We have archeological discoveries, where dating is almost always somewhat speculative, and reconstructions of the ancient Greek maps, and the views of the Mesopotamian and Chinese records. From the Mesopotamian, Chinese, and Greek texts, from the archeological discoveries of the kurgans, from the written monuments, we get a glimpse of the nomadic nations of the Central Asia in the 5-th c. BC. The various interpretations of the graphics and contents of the inscription witness the paucity of the finds and the potential for the studies. In the spring of 1970 in a suburb of the city Issyk, fifty kilometers from Almata, archeologists of the Kazakhstan Academy of Sciences excavated one of the so-called royal kurgans of the Saka time (leading archeologist Candidate of Historical Sciences K.A.Akishev, initiator B.N.Nurmuhanbetov). Under kurgan in timbered grave was found a burial of a noble warrior in a coffin made of boards. The warrior's helmet, caftan, sharovar pants and boots were decorated with golden plates and badges with images of snow leopard, horse, mountain goat and archar, depicted in Scythian animal style. The buried was armed with a sword with golden handle. In the same timbergrave were various utensils (up to thirty objects): rectangular wooden dishes, thin-walled clay vessels, ornamented bowls of silver and bronze, silver spoon (spoon handle in shape of a bird head with a long beak), and at last, a silver cup with mysterious runic-like inscription (see amended sketch). All inventory of the burial was sent for processing to the department of archeology in the C.C.Valihanov Institute of History, Archeology and Ethnography (Kazakhstan). At last, in the autumn of the 1970 we received a first opportunity to study directly the objects from the Issyk kurgan, including the silver cup with inscription. In many attributes this burial belongs to the 5th-4th cc. BC, as roughly estimated the extremely cautious K.A.Akishev1 (carbon dating of Issyk kurgan) . The inscription is etched with a sharp object on the external side of the silver cup and consist of 26 runic-like letters located in two horizontal lines. A top line runs across the center, a bottom line is on the convex surface of the cup. Both lines begin from a shaded rectangle. The top line has 9 letters, the bottom has 17 letters (including a letter located separately at the end of the line, after a damaged part). These letters display similarity with letters of Mediterranean early alphabetic scripts2, and with Ancient Türkic runes. To what degree this mysterious similarity is supported by similarity of phonetic sounds of the compared letters? We shall try to answer this question based on our reading of the inscription that follows. 15) Letter ä is definitely approaching the Orkhon а, ä. A remarkable paleographic distinctiveness of the r. Ili cup inscription, like the inscription on a silver dish from the r. Yaik, is the absence of word separators. As a whole, the paleographic analysis of the runic-like inscription agree completely with its archeological dating of the middle of the 1st millennium BC. (1) аγа sаηa očuq = Aγa, saηa očuq! "Senior brother, (this) hearth is for you!" "Stranger, kneel! Progenies [shall have] food!" Altai azyk "stock, supplies (provisions)". The contents of this inscription testify to the ancient funeral ritual grounded in the belief in afterlife. The diseased needed a constant care of his relatives and dearest. The traces of the ritual are found and in the Ancient Türkic stone figurines representing the deceased with a bowl in the right hand, and also in the vestiges of similar representations among the Türkic-speaking peoples, including at Kazakhs8. As the offered reading allows to judge, the inscription on the silver cup belong to fairly early version of the Türkic runes, associated closely with the alphabetical writings in the Mediterranean in the middle of the 1st millennium BC. This inscription is made in the Ancient Türkic language, which apparently spoke the early nomads of Jeti-Su area. The examined inscription gives reasons to reconsider the traditional concept about an absence of alphabetical writing among the early Asian nomads, and gives a serious impetus for further scientific research. The decoding of the proto-Türkic runic-like inscription on the silver cup, presented for the first time in 19719, remains unshaken, because of the absence among ideological opponents and dilettantes any serious arguments and scientific publications refuting the published decryption 10. 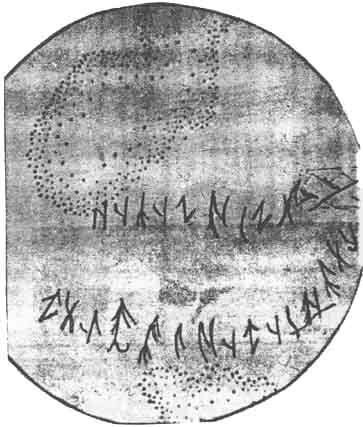 In addition, in the 1986, an examination of a bronze mirror from Issyk kurgan11 raised a suspicion that the mirror (in a top part of a thickened brim along the edge of the disk) are runic letters jübči (i.e. yübči) "protector (? )", barely readable now, probably because of excessive chemical cleaning. 1 Compare Akishev K. Kurgan Issyk. Art of Kazakhstan Sakas. М., 1978, p. 38: "A synchronization of the Issyk dated objects with their analogues from the neighboring regions enables establishing the time of the burial in the Issyk kurgan in wide chronological framework of the 7th-4th centuries BC. Once again we shall remember that the early chronological horizon is determined by the art objects which can be present in the later complexes as relicts". 2 As a comparative material for early writings of the Mediterranean were used the following works: Diringer D. Alphabet. IIL, М., 1963; Jensen Н. Die Schrift in Vergangenheit und Gegenwart. Berlin, 1958; Friedrich J. Geschichte der Schrift. Heidelberg, 1966 (Russian translation: Fridrih I. History of the script. M., 1979); Sevогoskin V. V. Zur Entstehung und Entwicklung der kleinasiatischen Buchstabenschriften. "Kadmos", Band VII, Heft 2, Berlin, 1968, pp. 150-173. See also: Secrets of ancient scripts. Problems of decoding. Coll. of articles. M, 1976. Malov S.E. Monuments of Ancient Türkic writing of Mongolia and Kirgizia. M.-L., 1959, p. 63-68. 4 Ancient Türkic Dictionary. L., 1969, p. 48. This edition is usually designated in abbreviated form - ATD. 5 Malov S.E. Monuments of Ancient Türkic writing. M.-L., 1951, p. 59, 63. 6 Mahmud Koshgari, Turkiy suzlar devoni ("Divan lugat at-türk"), vol. 3. Translated (to Uzbek) and has prepared for publishing S.M.Mutallibov. Tashkent, 1963, p. 174; Devonu lugotit turk. Index-dictionary. Under red. of G.Abdurahmanov and S.Mutallibov, Tashkent, 1967, p. 53; ATD, p. 89. 7 Malov S.E. Monuments of Ancient Türkic writing, p. 24, 31. 8 Compare Valihanov Ch.Ch. Works (Works of Chokan Chingisovich Valihanov under red. of N.I.Veselovsky). "Notes of Russian geographical society Ethnography branch", vol. XXIX, SPb., 1904, p. 28. 9 Amanjolov A.S. Runic-like inscription from Saka's burial near Alma-Ata. "Bulletin of Academy of Sciences KazSSR", 1971, No 12 (320), p. 64-66; Amanjolov A.S. Materials and research on history of Ancient Türkic writing. Author's abstract of Ph. Doctor Dissertation, Alma-Ata, 1975, p. 48-52; Amanjolov A.S. Türkic runic graphics, 3. Alma-Ata, 1985, p. 31-39. 10 Compare Akishev K.A. Issyk script and runic writing. "Ancient Türkic civilization: monuments of writing". (Materials of international scientific theoretical conference dedicated to the 10th anniversary of Republic Kazakhstan independence, Astana, May 18-19, 2001). Almaty, 2001, p. 389-395. 11 See color picture of the bronze mirror: Akishev K.A. Kurgan Issyk. Art of Kazakhstan Sakas. М., 1978, p. 113. Photo of unrolled runic-like inscriptions on the silver cup is also displayed ibid, p. 54-55.